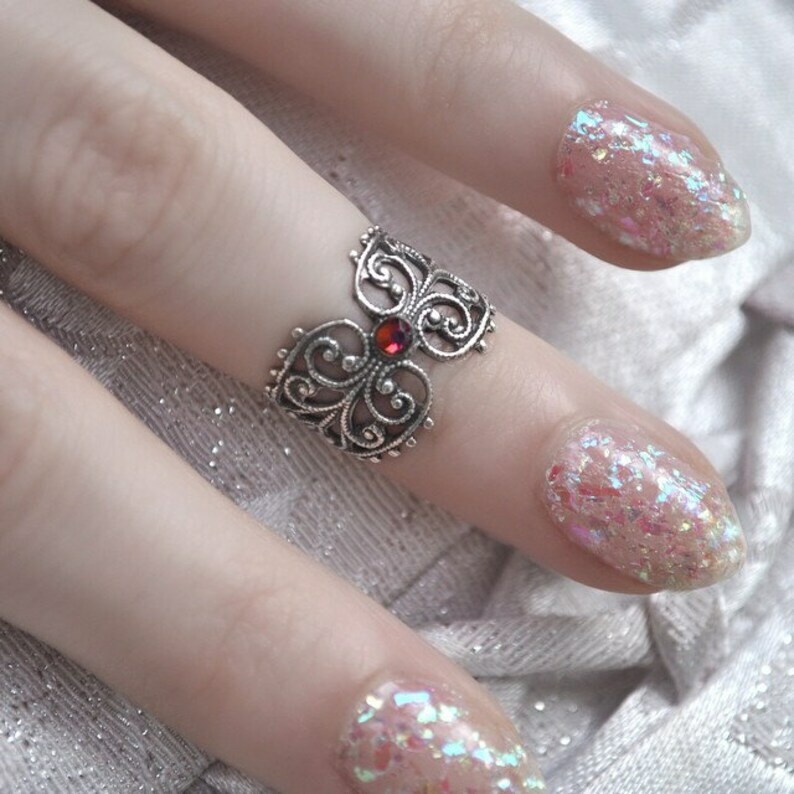 Details matter and can transform your look, like this filigree knuckle ring in antiqued silver. It features a genuine Swarovski crystal of your choice of color. You will receive one ring. It is available for sizes US 3 and 4 but you can easily adjust it a bit for better fit. ♥"BEAUTIFUL, everybody asks me where I got it!" ♥"love love love will get more"
♥"Perfect, arrived quickly. Thank you!" ♥"love love love i am in love with these rings i get comments all the time on how stunning they are"
♥"Love this ring. I wear it almost daily. I received it very quickly. Extremely pleased with my purchase." ♥"The ring is gorgeous! It fits and looks absolutely great!" A beautiful ring - delicate with just the right amount of sparkle. Such a cute ring! It came packaged very nicely as well. Thank you very much! We accept direct checkout and PayPal. We accept returns and will refund the listing cost (shipping costs are excluded). Contact us within 3 days after you have received your order. Then send the parcel back to us within 14 days and after we have received it, we'll issue a refund. Any shipping costs that may incur, are the buyer's responsibility. Please note that you have to send your order back in the same condition you purchased it. We ship WORLDWIDE from Greece, Europe usually within 3-5 days unless otherwise stated in the product's description (i.e. made to order), using Hellenic Post Services. All orders are shipped with registered mail and have tracking number, to ensure the package will not get lost. Upon shipment, we will notify you about the number, so that you can track your package online any time. If you are in a rush and need your order in a few days you can upgrade to express mail. It provides delivery within 2-3 working days to principal destinations. Please select the EXPRESS shipping option. Delays may occur during holiday/ high traffic season, as well as due to the quality of the country's postal service. Once I have shipped your order I cannot be held responsible for these delays. Please note that buyer is responsible for any duties, customs and taxes levied by their individual countries. We offer free complimentary gift wrapping with any order! Depending on the item, the order will either be delivered in a beautiful box wrapped with ribbon or in an organza pouch. For extra security, I mail all orders in bubble mailers or cardboard boxes for large items or multiple orders. Lost parcels are rare occasions and damaged orders even more but if this is your case contact us immediately to resolve the problem. ♥Our customer satisfaction is our most important goal. Therefore if you experienced any problem with our products or customer service, please let us know immediately!